Millennium Recycling Flood Cleanup: Please not in the bin! Sadly, many in our community are still dealing with flooded homes and basements. At Millennium, we are seeing quite a bit of flood waste items coming from the cleanup. Please, do not place these items in your recycling bin. The Sioux Falls recycling bin is only meant for single stream items (see accepted items here). You may bring these items to the Sioux Falls Regional Landfill. To help people that are still impacted by area flooding, the Landfill entry fees are being waived through Saturday, April 13, 2019. People can bring items such as those listed above to the landfill in tarped loads from Monday through Saturday, 7:30 AM to 5:00 PM (Closed Sundays). Learn more here. These items cause a lot of extra work for the team members at the recycling facility who already have a tough job. They must be pulled out of the pile to send to the landfill before they damage the recycling equipment or hurt any employees. This slows the process way down and risks contamination of good material. Please think before you toss it in. Thank you! There are 0 comment. 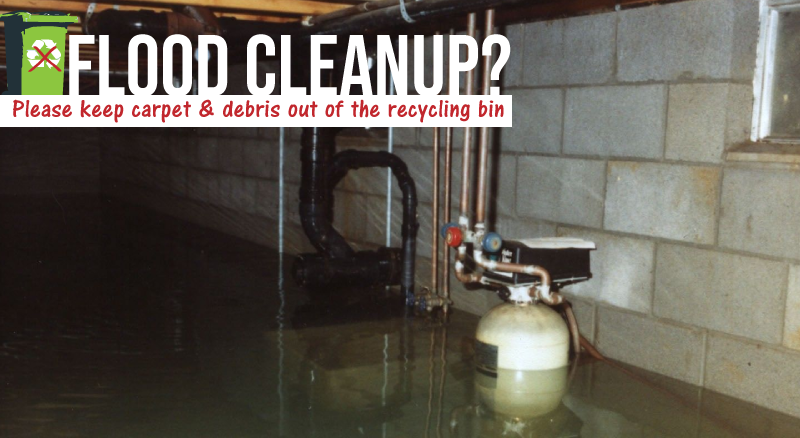 on "Flood Cleanup: Please not in the bin!"